Moscow and Beijing are both opposed to "extreme sanctions" on North Korea, Russia's foreign minister says. "We with China have a common position in the need... not to be emotional," Sergei Lavrov told reporters in Moscow. The United Nations Security Council is expected to vote on Saturday on a US-sponsored draft resolution calling for sanctions on Pyongyang. The move follows Monday's announcement by the North that it had tested a nuclear weapon. The US has revised a draft resolution to remove the threat of imminent military action, in a effort to allay Chinese and Russian concerns. US ambassador to the UN John Bolton said he expected the vote to be held on Saturday. "There may some additional changes to the text, but we do have unanimous agreement," he said. This was confirmed by Japanese envoy Kenzo Oshima, the current council president. "All council members are asked to come back tomorrow [Saturday]," he said. Mr Lavrov - after meeting with a senior Chinese envoy in Moscow - said the two countries believed the response should not "give way to emotions" and avoid "extreme sanctions". The new US draft resolution restricts sanctions to non-military actions and limits arms sanctions to heavy weapons only, but retains a controversial provision allowing nations to inspect cargo moving in and out of North Korea in pursuit of non-conventional weapons. The resolution urges Pyongyang to implement a September 2005 agreement in which it pledged to give up its nuclear programme in exchange for aid and security guarantees. Negotiations to resolve outstanding issues are continuing. Meanwhile, new Japanese sanctions against North Korea have already come into force. The measures, first announced on Wednesday, include trade and travel bans, barring North Korean ships from Japan's ports, and freezing imports and visits by North Korean officials. Pyongyang has promised "strong countermeasures" against any sanctions. 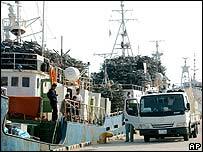 North Korean vessels deliver crabs, clams or prized matsutake mushrooms to Japan, returning with used bicycles, used cars, motorcycles or old household appliances. Ships have been loading up in Japanese ports ahead of the Friday midnight (1500 GMT) deadline. US Secretary of State Condoleezza Rice is due to tour China, Japan and South Korea next week in an attempt to galvanise support for a strong stance against Pyongyang. South Korean President Roh Moo-hyun has held talks in Beijing with his Chinese counterpart, Hu Jintao, on how to respond to North Korea's claimed test. A top South Korean official said the two men did not discuss the details of the draft resolution but agreed in general principle to support UN action. "The two leaders agreed to support appropriate and necessary counter-measures by the UN Security Council against North Korea," Song Min-soon, Mr Roh's National Security Adviser, said. 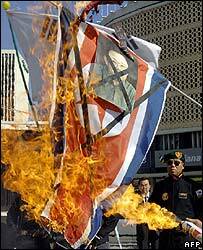 Mr Roh is facing increasing pressure at home to reverse his so-called "sunshine policy" of engagement with the North. As many as 3,000 protesters gathered outside Seoul city hall to demand the government cut off aid and investment. But there has been some speculation that the test was unsuccessful, based on the relatively small size of the blast. The US said on Friday that it has so far not established that the North's test had reached the nuclear threshold. This does not mean that the explosion was not nuclear - just that the tests the US have run thus far cannot definitely conclude that this was the case, officials told the BBC. Both South Korean and Chinese scientists said they had detected no evidence of radioactivity in air, soil and rainwater tests. But Yoo Bong-jin, an official with South Korea's ministry of science and technology, warned that the findings were not proof that a nuclear test had failed.